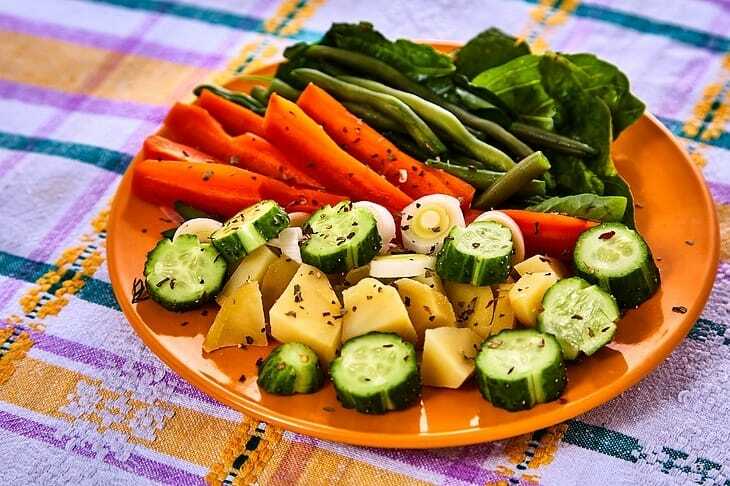 There is little doubt that adding more vegetables to your ﻿d﻿﻿i﻿﻿e﻿﻿﻿﻿﻿﻿﻿﻿t ﻿is also going to be good for your health. The ﻿nutrients in vegetables﻿ can help you maintain a healthy blood pressure, lower your risk of heart disease and even reduce your likelihood of developing cancer. If you're like many people, myself included, you know that preparing and cooking veggies isn't always the easiest task. Buying a vegetable steamer, however, can revolutionize how you cook meals and drastically improve the nutritional content of the food you prepare. Keep reading to learn more about what to look for when shopping for a vegetable steamer and to get the best one on the market. 5 Of The Best Vegetable Steamers On The Market - Don't Shop Until You Read This! What Is A Vegetable Steamer? A vegetable steamer is a relatively simple device that uses steam to heat and cook vegetables as well as other foods of your choosing. ​A vegetable steamer can be a sealed appliance made of plastic that is electric, or a simple metal, plastic or bamboo basket placed over a pot of boiling water and sealed with a lid. The key to vegetable steaming is that the vegetables aren't directly placed into the water or against the hot surface of a pan. A steamer cooks vegetables only through steam, and electric versions can often get the job done in less time and with less hassle than traditional manual vegetable steamers. 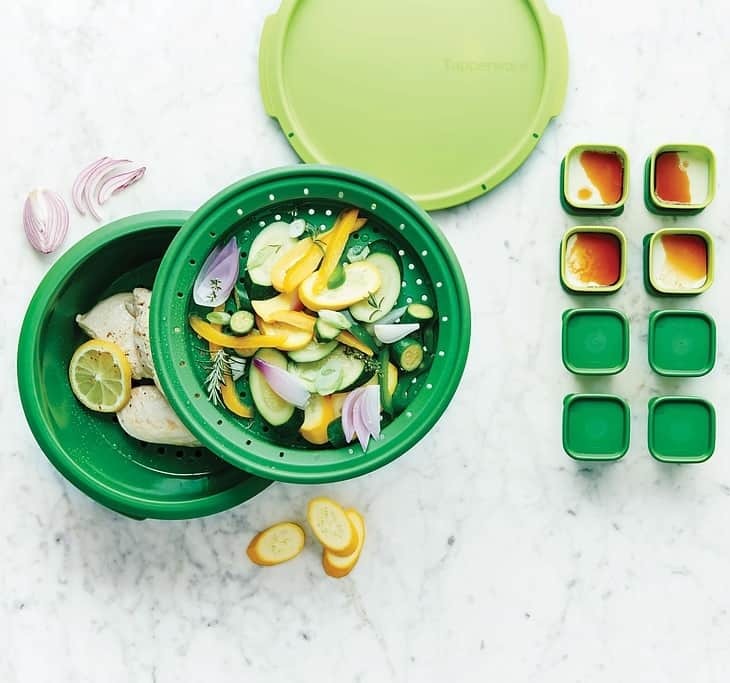 No matter which kind of vegetable steamer you choose, you'll find it's easier than ever to prepare healthier meals without any added stress. Food steamers work without the need for a cooking oil, so they are a smart way to reduce the fat and calories of many meals. 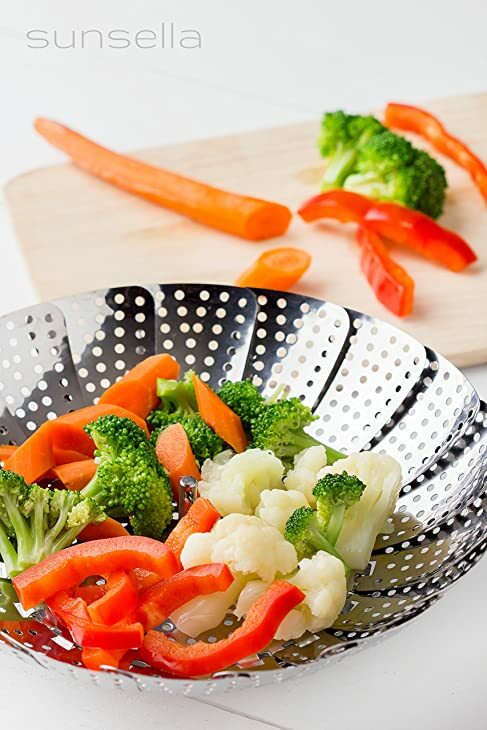 A vegetable steamer means that you don't need to boil veggies, which can remove some of their key nutrients. Steaming vegetables keeps them crisp, flavorful and nutritious, and it is a very hands-off process. When it comes to choosing the best vegetable steamer, you'll have one big decision to make: electric or traditional? If you plan to steam vegetables frequently, and you have the space in your kitchen, then an electric vegetable steamer is a popular option worth considering. An electric vegetable steamer doesn't require that you turn on the oven or boil any water. All you need to do is place the vegetables into a tray or compartment within the steamer and turn it on. It really is that simple! A traditional vegetable steamer is nearly as effective and comes at a much cheaper price. A traditional vegetable steamer is typically a metal sieve or a plastic bowl, always with holes to allow for steam and drainage, that gets placed within a large pot filled with boiling water and covered with a lid to keep in the steam. There is also a third option: a microwave steamer. 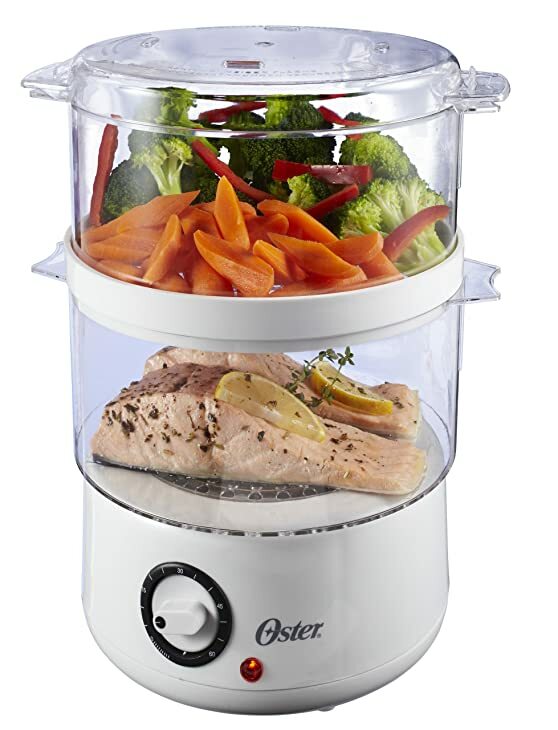 This steamer is generally made from plastic and steams vegetables in a hurry in your microwave. Plus, it's very easy to use: fill water, place food, stack and steam. 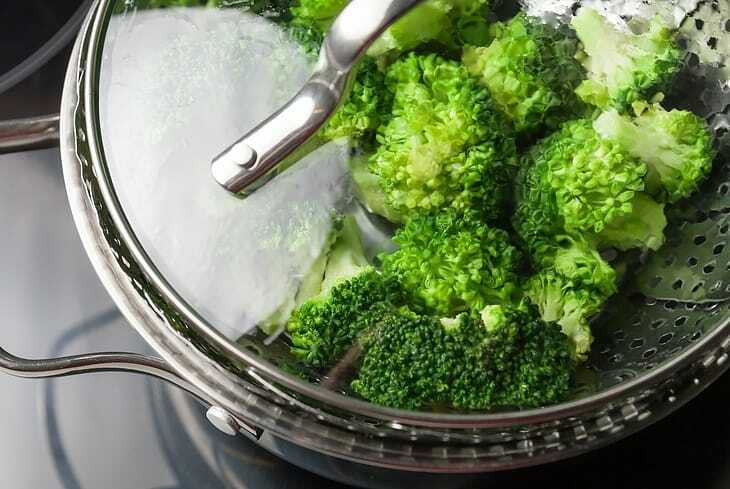 While there are several considerations to make when choosing a vegetable steamer, think about whether you could benefit from the addition of a timer. 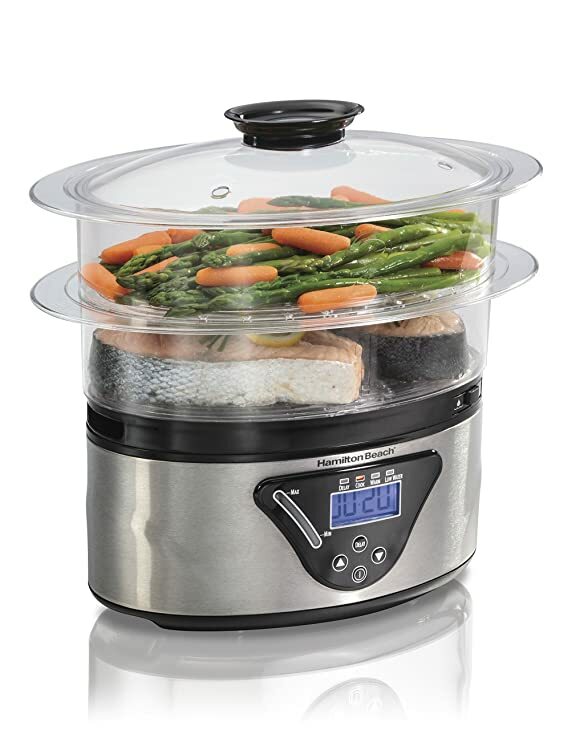 If you lead a busy lifestyle and want to eliminate the amount of time you spend in the kitchen, then an electric vegetable steamer with a timer will typically be your best bet. You can set a specific time depending on the quantity, the level of softness you prefer and the kind of vegetables being cooked. The device will shut off and prevent your delicious vegetables from becoming overcooked. However, not all timers are 100 percent accurate, and there is the potential to end up with over-cooked or under-cooked vegetables. Many of the most common complaints about vegetable steamers only present themselves when a buyer doesn't do their homework. If you're concerned about the space that a vegetable steamer might take up in a crowded kitchen, opt for a collapsible version or one that is very small and fits right inside of your favorite pot. If you're worried about how hard it might be to clean a vegetable steamer, then make it a priority to choose one whose components can easily go into the dishwasher after each use, saving you both time and hassle. Most traditional vegetable steamers can pop into the dishwasher, and many electric vegetable steamers can place their compartments or trays into the dishwasher for easy cleaning as well, although some parts may need to be wiped down by hand. The Sunsella Vegetable Steamer in stainless steel is exactly what you expect a traditional vegetable steamer to be. Made from 100% stainless steel, the steamer can be adjusted to fit a range of pot sizes. While I appreciated that the vegetable steamer could expand to fit the mouth of various pots, I loved even more that it could collapse back into a small size that is then easy to store. A simple central ring, also made from stainless steel, helps you lift up the steamer once the veggies are cooked and ready to be removed from the pot. There is no assembly required, meaning you can pull it right out of the box and put it to work immediately. The silicone family size steamer from Zoie + Chloe is a three-piece set that consists of a silicone dish, a silicone colander that fits within the dish and a silicone top that covers the tops of both. 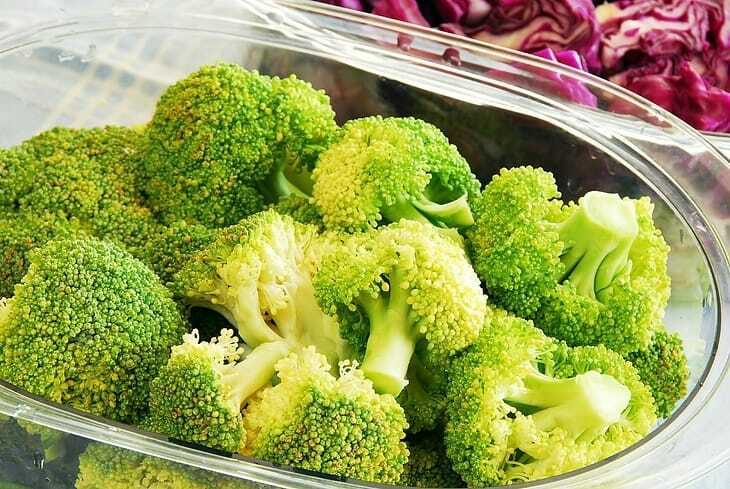 To steam vegetables right in the microwave, you can place water into the dish, pop your vegetables into the colander and simply cover the top with the lid. This setup is straightforward and very easy to use, and it delivers on its promise to quickly steam vegetables. 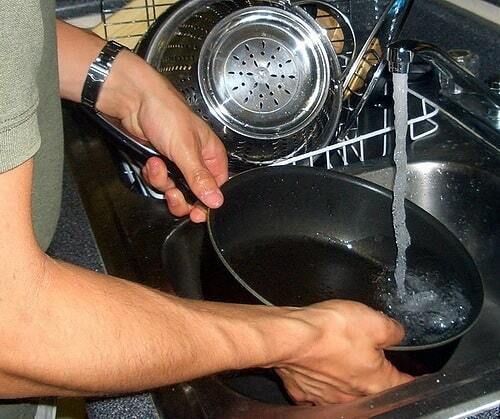 The colander is also great for draining out any excess water after the steaming process is over. 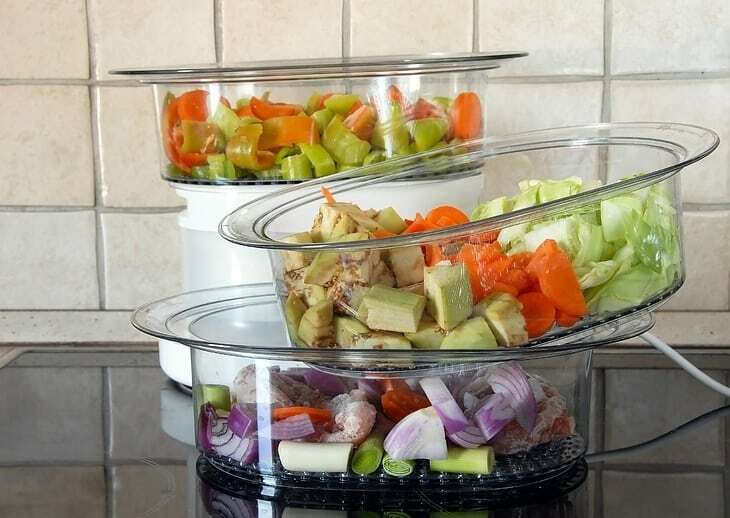 The vegetable steamer can also steam meats or be used to reheat foods in the microwave without drying them out. The Hamilton Beach Digital Steamer is a top-rated electric steamer suitable for cooking meals for the entire family. Since its capacity is 5.5 quarts, this is on the larger size for a vegetable steamer. 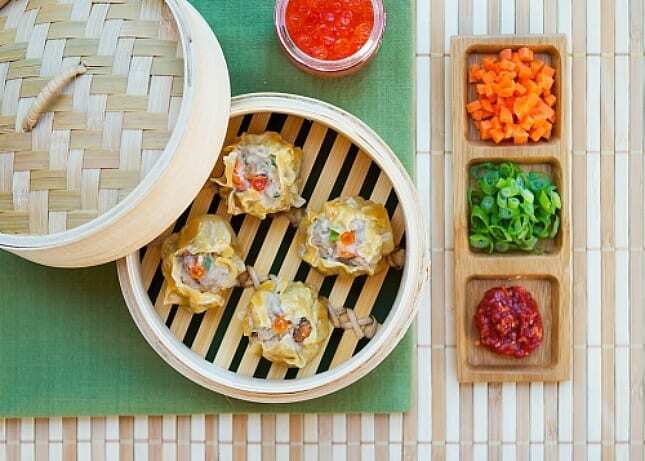 You can choose to use the entire thing as one steamer, or use dividers to separate foods items. This was very helpful when serving up vegetarians who wanted their vegetables to be separated from any meat. The Hamilton Beach Digital Steamer is very versatile and can steam meats and dumplings as well as veggies. Plus, there is a small rice bowl at the bottom of the device, meaning that you really can make an entire meal with this one kitchen appliance. The digital functions are easy to understand, and there are even functions like delayed steam and warming settings. 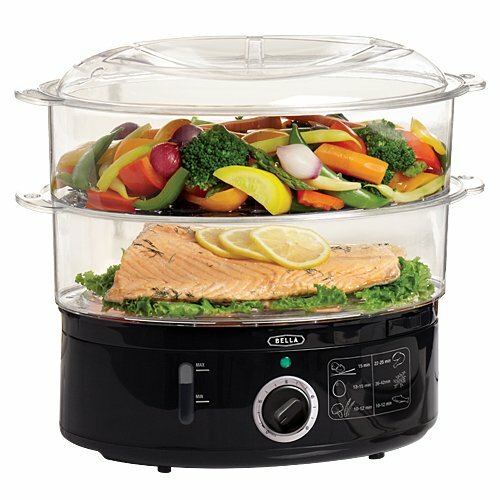 The Bella 13872 Food Steamer is a two-tiered electric device that has a very large capacity of seven quarts. This size makes it one of the biggest on the market, and it is definitely appealing for those who cook in bulk. 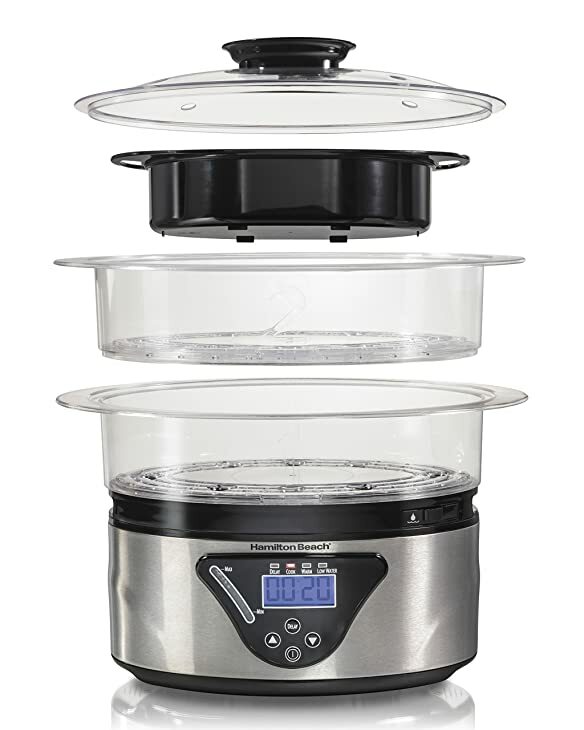 The food steamer needs to be filled with water in between uses, and there is a clear water level indicator as well as an external fill option so you don't have to turn off the steamer just to add more water. The two distinct tiers make it a breeze to cook different foods at the same time. Plus, the base of the device is a small rice cooker, an added function that makes the steamer truly versatile. 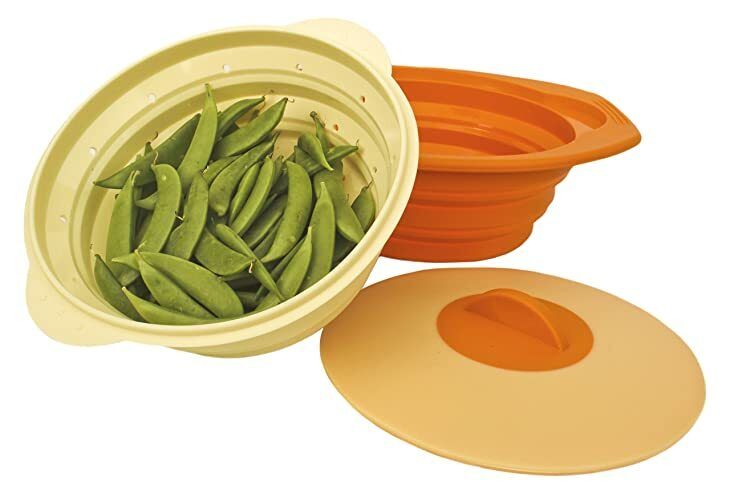 If you're looking for something that is inexpensive and effective, and you only plan to steam vegetables occasionally, then a top pick might be the Droiee Silicone Vegetable Steamer Basket Insert. 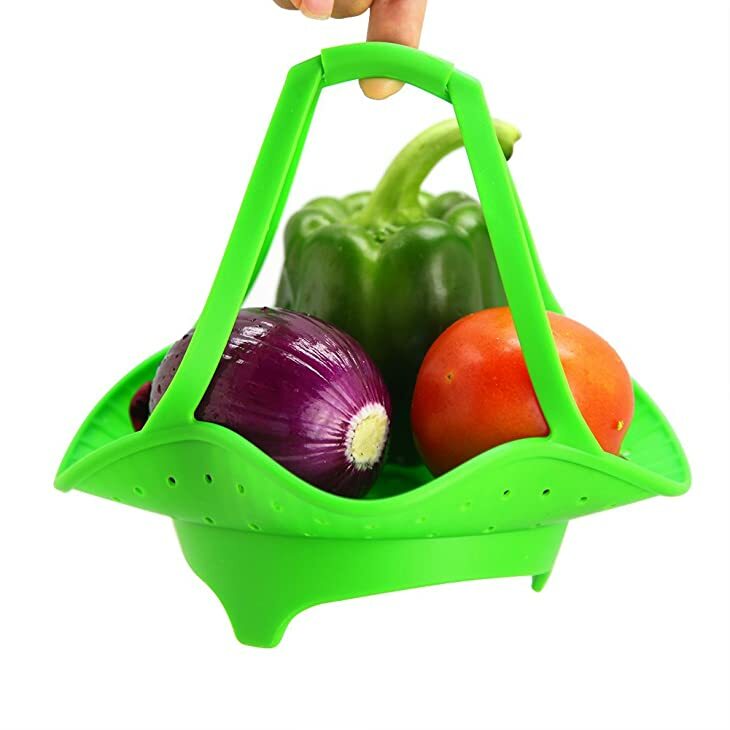 Made from food-grade silicone that is also BPA free, this vegetable steamer is a very cute, bright green basket that gets placed into a pot of boiling water and covered with a lid. It can also be used in the microwave if necessary. Since the handles of the basket are also made from silicone, this steamer is much easier to pull out of a boiling pot﻿﻿, making it safer and a little more comfortable to use than a metal vegetable steamer. 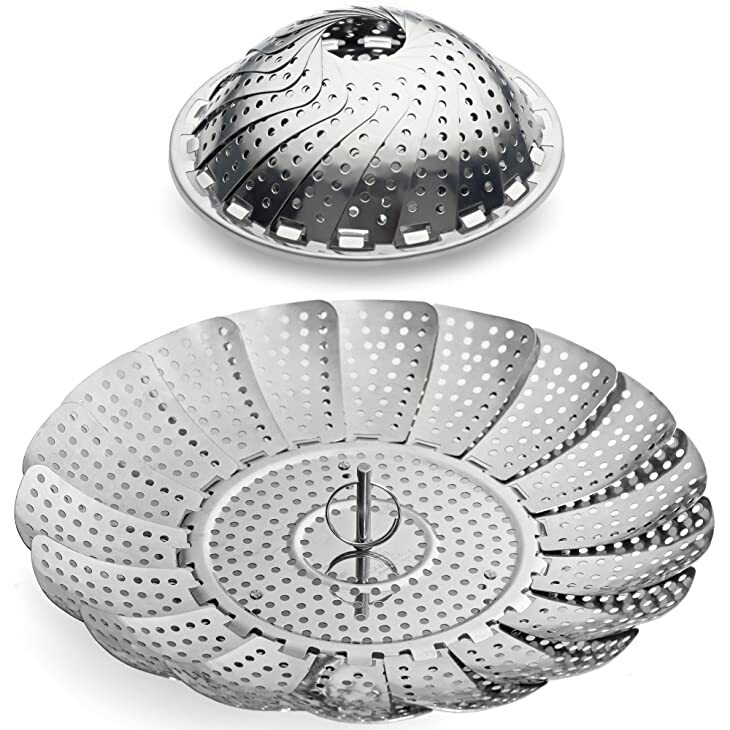 If you're searching for the best vegetable steamer, my pick is the Sunsella Vegetable Steamer﻿﻿. 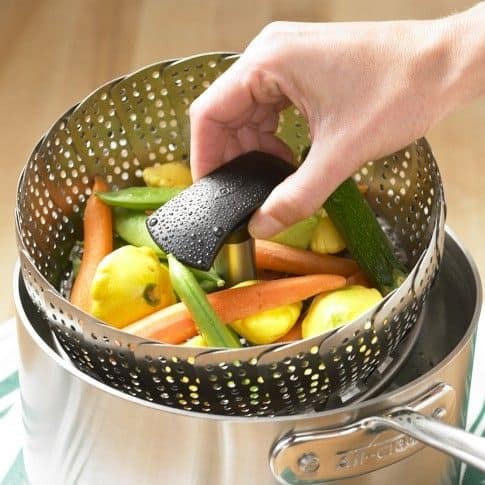 This really is the classic vegetable steamer, and it works quickly and efficiently for the tastiest, crispest vegetables. Since it is made of stainless steel, you never have to worry about rust. This is a durable item meant to last for years without problems. It also takes up very little space, won't impact the taste of the vegetables and goes right into the dishwasher when you're done. If you want a vegetable steamer that can also cook meats and rice while you're elsewhere in the home, then an electric steamer might be suited for you. If you're just after an inexpensive vegetable steamer that works perfectly, however, the ﻿﻿Sunsella﻿ ﻿version is ideal. Steaming is a great solution for health consious people since it retains more food's vitamins and mineral as opposed to boiling. It is also an excellent way to preserve the true flavor and quality of your ingredients. So why not start steaming today? Have you found this breakdown helpful? If so, please let me know in the comments. Be sure to share your own recommendations! i was searching for rice cookers and landed here. this is a really good article: simple, direct and good information. your ‘pro’ and ‘con’ section was particularly helpful. my bamboo steamers have worn out and i’ve been reluctant to replace them, but we eat a lot of steamed foods. so, i’ll take a look at one or two of your suggestions. btw, i like your logo. Hi Rodman, glad to know you like this article. Bamboo steamers have a very classic feel to it, and it may take some adjusting. Just like when you are using a gas stove and then transition to an electric one. It will feel weird at first but you’ll love it once you find your preferred set up. Thanks for your feedback!